In hydrodynamic theory, the slip is quantified by the Navier slip length : a distance from the wall, where the flow profile would become zero if extrapolated linearly. If the thickness of lubricant film , then the effect of slip is negligible. If on the other hand , slip cannot be ignored. The slip length was reported to reach up to , depending on the material properties and applied conditions, which is comparable to the hydrodynamic films developed in many situations. A team of researchers from Karlsruhe Institute of Technology and Fraunhofer Institute for Mechanics of Materials considered a theoretical surface with periodic slip/no-slip pattern sliding against a regular surface with a lubricant film in between. Using Molecular Dynamic simulations (MD), they showed that switch from no-slip to slip conditions gives rise to a pressure gradient, which can lead to cavitation. 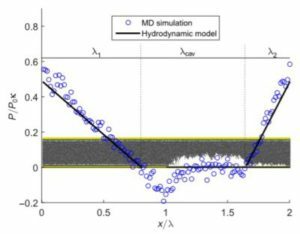 Cavitation, as well known in hydrodynamic theory, is necessary for load carrying capacity, as it was also confirmed by the simulations in the article. Using continuum mechanics and Reynold’s approximation, the team obtained a closed form solution for the pressure gradient and pressure drop in the presence of slip/no-slip areas on the surface and an excellent agreement with MD simulations was observed. Obtained relation implies that the pressure drop increases with the increase of the slip/no-slip periodicity length, viscosity, sliding speed and slip length and decreases quadratically with lubricant film ( ). 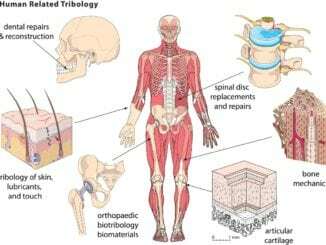 The relation was then applied to the randomly distributed patches of slipping areas and it was concluded that the relation still holds and is in agreement with MD simulation results. The slip effect is important not only for artificially patterned surfaces, but also for the regular ones. Many of them are naturally patterned by slip areas of various slip length. Examples are steel surfaces with random grain orientation, diamond surfaces with mixed hydrogen and oxygen terminations, etc. Since , with the decrease of the film , as in the case of transition from hydrodynamic to boundary lubrication ( ) in sliding contacts, the cavitation due to variation of the slip length may be unavoidable in many systems. This effect then may control friction and wear in the sliding contacts. 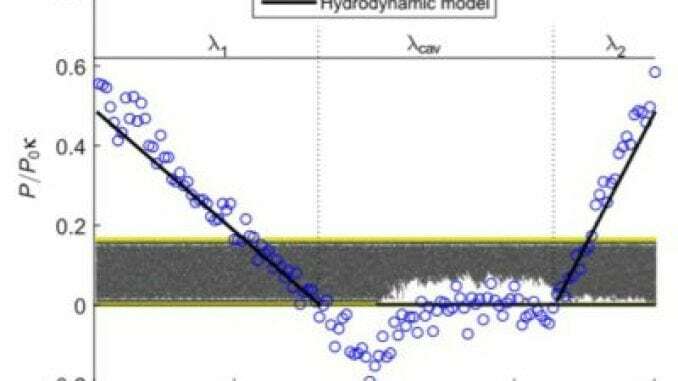 Cavitation due to slip length variation as a main feature of the boundary lubrication proposed by the researchers is different from the current theories and may open a new path of its further exploration. Further details can be found in the original article: “Boundary lubrication of heterogeneous surfaces and the onset of cavitation in frictional contacts”, D. Savio, L. Pastewka, P. Gumbsh. Image edited from: “Boundary lubrication of heterogeneous surfaces and the onset of cavitation in frictional contacts”, D. Savio, L. Pastewka, P. Gumbsh. There can be no true laminar flow of lubricants in the presence of surface asperities. It is not (actually) a matter of the relationship between fluid viscosity (HC chain length) and asperity height, it is a matter of flow characteristics (CFD) over asperities. As the fluid flow encounters the asperity, vortices are produced in the flow pattern. A “stall region” develops on the near side, while a vortex develops on the far side. The vortex flow pattern expands into the flow region further disrupting flow. “Bubbles” then form from the resulting pressure gradients (disturbed flow) that later implode with enormous force, producing (locally, on the nanoscale) gigantic amounts of damaging heat. This is yet another reason why the only solution to friction in hydrodynamically lubricated systems is the complete removal of asperities. I also think there is cavitation due to roughness, but there may also be cavitation due to variation of the slip length. Roughness may contribute to it as well. But cavitation brings load carrying capacity, so its interesting to find out, whether its solidification of the oil is responsible for the friction levels in boundary lubrication regime or roughness (or slip length variation, or some other way) induced cavitation? “I also think there is cavitation due to roughness, but there may also be cavitation due to variation of the slip length….But cavitation brings load carrying capacity…”. Aydar, “variation in the slip length” (slip-stick-slip-stick) will produce disturbed flow on the macroscale. This disturbed flow will produce vortices, leading to cavitation events. As for cavitation itself, that is produced from bubble implosion. Nature’s first CFD physicists to discover this, and make beneficial use of the phenomenon, were the Pistol Shrimp. How damaging cavitation has anything to do with load-carrying capacity is a puzzlement to me. If the Reynolds equation is solved without cavitation boundary condition, the pressure profile is anti-symmetric and zero load can be carried by the contact. Only when there is cavitation, there is a load carrying capacity, because in this case, the pressure profile is not anti-symmetric anymore. This effect is used when texturing of the surfaces is applied to increase the film thickness. Local cavitation areas allow to bring additional load carrying possibility. Cavitation is damaging, which is well known, but it is also necessary for pressure build up. So variation of slip length will produce cavitation, as discussed in the article, which may be responsible for the macroscale friction in boundary lubrication (the slip variation effect becomes important). And as these guys argue, this may be a new way to look at it. In my understanding, the question is, why in the presence of the lubricant without any additives, the boundary friction level drops compared to non-lubricated case (if we assume that the oxide layers remain on the surface and no adhesive wear is initiated)? Could this be due to local cavitation, which brings some load carrying capacity when other hydrodynamic effects are negligible (due to speed, viscosity, etc.)? “This effect [induced cavitation] is used when texturing of the surfaces is applied to increase the film thickness. Local cavitation areas allow to bring additional load carrying possibility.” Pure insanity! If any of this were actually true, ISN technology (atomic-level surface perfection) would not work. But, it does! 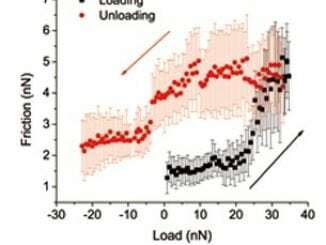 Hydrodynamic lubrication theory relies on the presumption that “incompressible” fluid separation of the interacting surfaces is necessary for load carry due to the presence of asperities; this, because less than 1% of the nominal contact area is actually in contact with the corresponding surface. But what happens when the asperities are gone? Dennis… I didn’t think the “EHL Fests” were actually dangerous, but maybe they really are! The idea of purposefully induced cavitation to be used as part of a mechanical lubrication regime (induced pressure to provide load carry capability) is pure lunacy. If ever there was evidence of the failure of EHL as a paradigm, this is it. Well, surface texturing is used in some applications to increase the film thickness, and the working mechanism behind it is the local cavitation. If you read also the discussed article, you would see that the authors calculated (using molecular dynamics) an increase of the film of 10% in case of the presence of slip length variation induced cavitation compared to the case of no cavitation. If the surfaces are smooth, it does not mean that there is no cavitation. The macro geometry convergence/divergence would create a pressure drop and the cavitation at the outlet of the contact and this will create the positive integral of pressure profile. There is no film build up only between smooth parallel surfaces and no load carrying capacity, because there is no pressure drop and no cavitation. Hydrodynamic theory does not rely on “incompressible” fluid separation to explain the load carrying capacity. It comes from positive pressure curve, which is a result of the cavitation (otherwise it would be anti-symmetric). “Well, surface texturing is used in some applications to increase the film thickness, and the working mechanism behind it is the local cavitation.” My point exactly. This is lunacy. I cannot advocate the use of the most destructive force known, to overcome asperity heights through artificial increases in film thickness through induced vorticity. I have no interest in stalling lubricant flow (inducing vorticity) to increase film thickness in the hopes of overcoming asperities that no longer exist, because I have already removed them with ISN. “If the surfaces are smooth, it does not mean that there is no cavitation.” If the surfaces are atomically-smooth, how is vorticity being induced? If there is vorticity in the divergence zone, it is post contact zone and harmless. “Hydrodynamic theory does not rely on “incompressible” fluid separation to explain the load carrying capacity.” Where is that positive pressure (load carrying capacity) coming from, if not from the compression of the so-called “incompressible” fluid? The vorticies you write of do not exist in a vacuum, but in a fluid. Why not to use cavitation to increase the film thickness? We use ultrasonic bath (cavitation) for cleaning materials and it is not destroying the them, so why should it destroy material in the contact? For some materials and situations, cavitation is really damaging, but its not always the case. Cavitation is not good or bad, so if you can use it, why not? The positive pressure profile comes from cavitation, not from the compression of the fluid. No cavitation – anti-symmetric pressure profile, and no load carrying capacity. It happens with any fluid, compressible or incompressible. 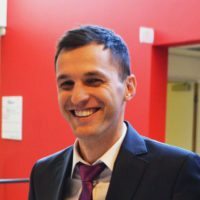 “Why not to use cavitation to increase the film thickness? We use ultrasonic bath (cavitation) for cleaning materials and it is not destroying the them, so why should it destroy material in the contact?”. Aydar, the only reason to use cavitation to increase film thickness is in the hopes of overcoming the asperity heights on the surfaces. Why would that be necessary when the asperities have been removed via ISN? 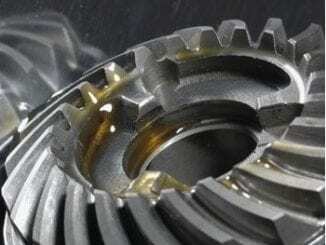 Induced vorticity impedes flow and causes the liquid lubricant to actually become a source of friction itself. This violates the very aim of lubrication. As this concept actually produces friction, as part of a scheme to reduce friction, I call it lunacy. You mention the beneficial use of the destructive forces of cavitation in ultrasonic cleaning. Ultrasonic cleaners operate at very precise power levels and highly specific frequencies. Try using the wrong power level or inappropriate frequency and you will see (very quickly) the damaging results on the surface of the item subjected to that mistake. I agree, if there are no asperities, you dont need these type of film thickness increase mechanisms. At the same time, I can imagine that there are systems, where you cannot do ISN. Or ISN is applicable in any contact? Cavitation can be destructive. In my understanding, though, the cavitation which happens within the contact due to roughness is not the major source of damage (wear), since the existing mechanical models (theories) somehow fit experimental data. ISN is pretty much universally applicable. In tribology, the enemy is friction, but its evil minion is HEAT. Much of the damage done by heat is subsurface and will not appear (as new asperities or crack propagation, etc.) until sometime later after the initial heat insult. As such, the models and data are flawed. If they were accurate and these existing lubrication paradigms were functional, things wouldn’t be breaking at the rates they do. Likewise, mechanical system efficiencies would skyrocket. Point being, we cannot look to – or accept – models that advocate introducing friction as a means of reducing friction. That’s simply insanity. If you are going to lubricate a system with a liquid, logic commands that the liquid flow as smoothly and rapidly as possible. The rub has always been the conflict between the necessary viscosity (to overcome the asperities) versus the desired fluidity (low viscosity) to improve efficiency. With ISN and its permanent removal of asperities from this equation, proper fluidity can be achieved in liquid lubricated mechanical systems.